Connect directly to any XR440 or XR5-SE Data Logger. 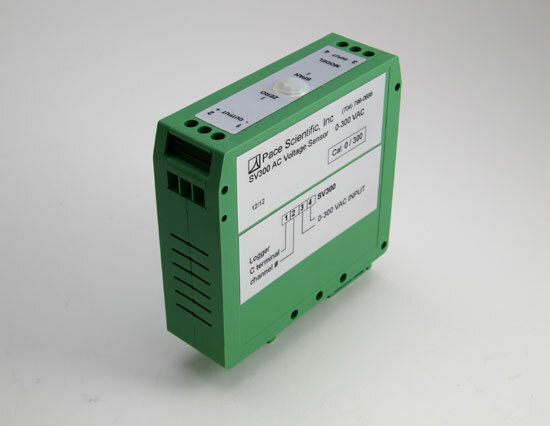 Or connect to a recorder or data acquisition system's 0-5vdc input. No external power required. Input Current AC Current, single phase, 50 - 400 Hz, load power factor 0.5 to 1.0 lead or lag. IMPORTANT: Unlike other PACE Pocket Logger Accessories, the AC Voltage Sensors must be mounted in a suitable panel or enclosure and the input & output terminals must be wired. Disconnect AC Power Source before wiring AC Sensor inputs. The SV600 Sensor includes an external potential transformer which also must be mounted and wired in a suitable panel or enclosure. External transformer size: 1.6"H x 2.8"W x 2"D.
Use the SV300 to monitor and record 24, 120 and 240 Vac circuits; use the SV600 to monitor and record 24, 120, 240 and 480 Vac circuits. SV300 0-300 Vac (50 - 400 Hz) $195. SV600 0-600 Vac (50 - 60 Hz) $230.